Updated on Oct 9, 2018 08:30 AM: The Cyclonic Storm, Luban which was over west central and adjoining southwest Arabian Sea has further intensified into a Severe Cyclonic Storm and has now taken a west-­northwest track with a speed of 14 kmph in last six hours and and remained over west central and adjoining southwest Arabian Sea, near Latitude 12.5°N and Longitude 61.0°E, about 900 km ESE of Salalah in Oman, 770 km E of Socotra Island in Yemen. The system is expected to move west­-northwestwards towards south Oman & Yemen Coasts during next four to five days. 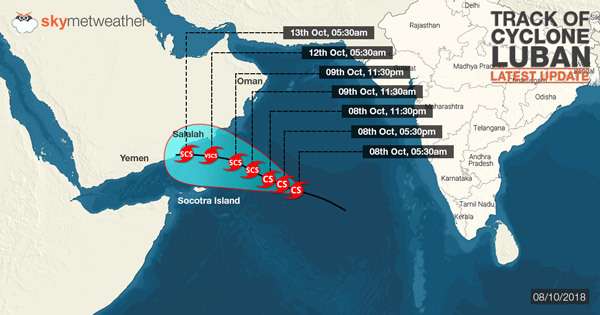 Updated on Oct 8, 2018 09:00 AM: The Deep Depression which was over Southeast and adjoining East-central Arabian Sea has taken a west­northwest track and was moving at a speed of about 20 kmph and has now intensified into a Cyclonic Storm Luban and lies over West Central Arabian Sea near Latitude 12.3°N and Longitude 62.4°E, about 1040 km east ­southeast of Salalah (Oman). The system is very likely to intensify further into a Severe Cyclonic Storm during the 24 hours. It is very likely to move west­northwestwards towards south Oman and adjoining Yemen Coasts during next 4 to 5 days. Moreover, there is no threat to the Indian coastline and only some rainfall will be observed due to peripherals of the system. The depression over southeast and adjoining east-central Arabian Sea has finally intensified into a deep depression. The system is centered at Latitude 12°N and Longitude 64.8°E, about 1240 km east­southeast of Salalah, Oman, 1140 km east­southeast of Socotra Island, Yemen and 990 km west­northwest of Minicoy, Lakshadweep Islands. However, as expected, the potential cyclonic storm has moved away from the Indian coast. The system has been travelling in westwards and would continue to track in the similar direction. With system churning in open waters, we can expect it to induce a cyclone during next 12-24 hours. If this happens, it would be named as Cyclone ‘Luban’. In fact, conditions are ripe for the system to gain more strength and intensify into a severe cyclonic storm in the subsequent 24 hours. As per weathermen, the deep depression is very likely to move in west­-northwest direction towards south Oman and adjoining Yemen Coasts in the coming days. However, we would maintain that the threat of torrential rains over Kerala has now been put off. The probable cyclone is now tracking thousands of kilometers far from the Indian Coast. Rains have already reduced, and Kerala and Coastal Karnataka have managed to record moderate rains with few heavy spells only. Similar weather activity would continue over both the regions and that only trail of the system would be responsible for the same. The well-marked low pressure area in Southeast Arabian Sea has finally induced a depression last night and is now seen over southeast and adjoining east-central Arabian Sea. The system is presently centered at 11.9°N and Long. 65.8°E, about 1320 km east-­southeast of Salalah, Oman, 1250 km east-­southeast of Socotra Island, Yemen and about 870 km west-­northwest of Minicoy, Lakshadweep Islands. The depression continues to travel in favourable weather conditions of warm sea surface temperatures and low wind shear. Thus, it is likely to induce a deep depression anytime soon and shortly into a cyclonic storm thereafter between October 7 and October 8. However, the system is now tracking west-northwestwards away from the Indian coast. By the time it would become into a cyclone, it would have moved far away from Indian mainland. It would only be the train of the system that would bring moderate to heavy rains over Kerala and Coastal Karnataka. The threat of any flooding rains are now ruled out, contrary to what weather models had been predicting during the last couple of days. Nonetheless, moderate to heavy rains would continue over Kerala for next 24 to 48 hours. The low pressure area over the Southeast Arabian Sea has intensified into a well marked low pressure area and lies over the same region. Moreover, in the next 12 hours or so, the weather system is expected to become a Depression. Thereafter, the system is likely to become a Deep Depression and Cyclonic Storm as it moves northwestwards towards the Oman Coast. Presently, the system has been observing favourable conditions for its intensification. After the system does intensify into a Cyclonic Storm and moves towards the Oman Coast, sea surface temperatures will be slightly cooler over that area which may cause the system to use its own reserve for strengthening. Published on Oct 6, 2018: As reiterated by Skymet Weather, the cyclonic circulation in Southeast Arabian Sea has now intensified into a low pressure area over the same region. In fact, weather conditions remain favourable for the further rapid intensification of the system. We can expect the low pressure area to induce a depression and deep depression during the next 24 hours. Not only this, we can expect system to strengthen into a cyclonic storm in the subsequent 24 hours, between October 7-8. With this, heavy rain with few spells of very heavy rains would continue over Kerala till October 8. Coastal Karnataka and South Interior Karnataka would also see moderate to heavy rains till that time. Weather in Bengaluru would also see impact over this system and would encounter some moderate to heavy showers. We would still maintain that Kerala and Coastal Karnataka would be worst affected in terms of some flooding rains and squally winds in the coming days. The system might travel away from the Indian coast, but it would trail of the system which would be responsible for some torrential rains. As per weathermen, the system would continue to move in west-northwest direction in extremely conducive weather conditions. This include warm sea surface temperatures which are presently around 29°C-31°C and low to moderate wind shear. Besides this, MJO (Madden-Julian Oscillation) is also presiding in the close proximity of Indian Ocean and is likely to visit the Indian waters soon. This has also been providing favourable weather conditions for the enhancement of any cyclogenesis between October 6-12. Sea conditions would continue to be rough to very rough along and off Kerala and Karnataka coast. Fishermen and locals are advised not to venture out in the sea.